This equation (which is, in essence, manometer expression of the aggregate-supply equation we have seen previously) relates the unemployment rate to the natural rate of unemployment, actual inflation, and expected inflation. In the short run, expected inflation is given, so higher actual inflation is associated with (onwer unemployment. (The variable a is a parameter that measures how much unemployment responds to expected inflation.) In the long run, people come to expect whatever inflation the Fed produces, so actual inflation equals expected inflation, and unemployment is at its natural rate. Thus equation implies there can be no stable short-run Phillips curve. Each short-run Phillips curve reflects a particular expected rate of inflation. 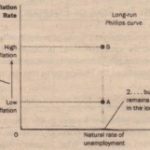 (To be precise, if you graph the equation, you’ll find that the downward-sloping short-run Phillips curve intersects the vertical long-run Phillips curve at the expected rare of inflation.) When expected inflation changes, the short-run Phillips curve shifts. According to Friedman and Phelps, it is dangerous to view the Phillips curve as a menu of options available to policymakers. 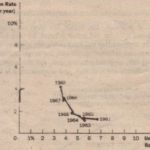 To see why, imagine an economy at its natural rate of unemployment with low inflation and low expected inflation, shown in Figure 5 as point A. Now suppose that policymakers try to lake advantage of the trade-off between inflation and unemployment by using monetary or fiscal policy to expand aggregate demand. In the short run, when expected inflation is given, the economy goes from point A to point B. Unemployment falls below its natural rate, and the actual inflation rate rises above expected inflation. As the economy moves from point A to point B, policymakers might think the; Lave achieved permanently lower unemployment at the cost of higher inflation-a bargain that, if possible, might be worth making. The higher the expected rate of inflation, the higher the short-run trade-off between inflation and unemployment. At point A, expected inflation and actual inflation are both low, and unemployment is at its natural rate. If the Fed pursues an expansionary monetary policy, the. economy moves from point A to point B in the short run. At point B, expected inflation is still low, but actual inflation is high. Unemployment is below its natural rate. In the long run, expected inflation rises, and the economy moves to point C. At point C, expected inflation and actual inflation are both high, and unemployment i s back to its natural rate. This situation, however, will not persist. 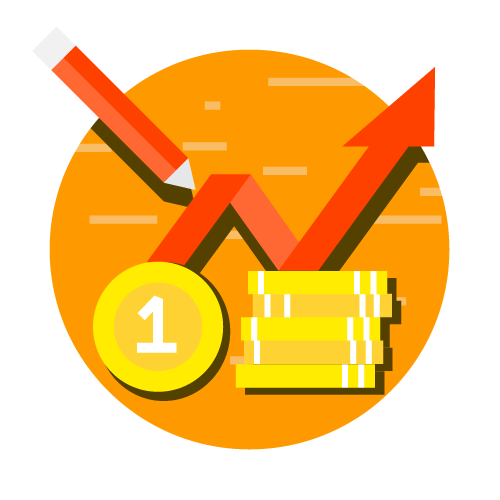 Over time, people get used to tins higher inflation rate, and they raise their expectations of inflation When expected inflation rises firms and workers start taking hyperinflation into account when setting wages. 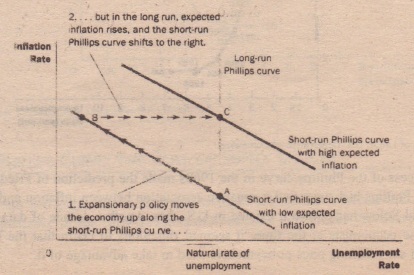 The short-run Phillips curve then shifts to the right, as shown it: the figure. [he economy ends up at point C, With higher inflation than at point A but with the same level of unemployment. Thus, Friedman and Phelps concluded that policymakers face only a temporary trade-off between inflation and unemployment. In the long run. expanding aggregate demand more rapidly will yield higher inflation without any reduction in unemployed.